The new play at Luna Stage sheds an intimate and provocative light on two visionaries: Vita Sackville-West and Virginia Woolf. The women shared a long and complex relationship. Enjoy a free preview of this witty and insightful play when Luna presents a scene at the Library. Click here to reserve your seat. Meet author Cathi Hanauer when she visits the Library to discuss her new book Gone. Hanauer's fourth novel, Gone, has received rave reviews. The book tells the story of a woman whose husband vanishes after driving the babysitter home. Vanity Fair said "Gone offers a clear-eyed vision of what is gained and lost in a contemporary marriage when the wife and mother begins gaining power outside the home." Join us for the first meeting of the Creative Connection, a partnership with the West Orange Arts Council. This monthly discussion group will focus on the creative process. Topics will include many things that affect artists, such as creative blocks, preparing for projects and competing in the marketplace. The group also offers a place to receive constructive feedback on your work. Everyone who enjoys the creative process is welcome. The Library will screen a documentary that explores poverty in Camden, NJ. Narrated by Martin Sheen, this powerful film is built around the letters of Msgr. Doyle, pastor of the Sacred Heart Parish in Camden. This program is funded by the NJ Council for the Humanities. October 12 - Shop Rite's dietician shares tips for healthy eating and provides some free snacks to sample! ADMISSION: suggested donation of $10 per person will benefit Beyond Unison and Farmstead Arts. Space is limited and reservations are strongly encouraged. To make reservations, visit BucknellFarmsteadConcert.eventbrite.com. Space permitting, tickets may also be available at the door. For more information, write to beyondunison@gmail.com or call 908.642.8691. Founded in 2004, Beyond Unison is dedicated to creating high quality a cappella music. The 18 member group, which includes Ridge High School alum, Annie Schulenburg, arranges all of their own music. Their repertoire includes songs by artists such as Ingrid Michaelson, Katy Perry, Regina Spektor, Mumford and Sons, and more. Besides performing live, they also dedicate time to a cappella recording and production. With the help of Liquid Fifth Productions, they recently released their latest CD Stop or Go, which can be found on iTunes. Their CDs will be available at the reception following the concert. The farmhouse is wheelchair accessible. Anyone anticipating the need for additional accessibility services is requested to make a request by sending an e-mail to the farmsteadartscenter@gmail.com in advance. There was a strong feeling that jazz has made the big leagues, as the New Jersey Symphony Orchestra performed Gershwin, Ellington and more in its first concert of the season at Morristown’s Mayo Center for the Arts Saturday afternoon. A program of jazz-inspired “classical” music was presented under the baton of the orchestra’s Quebec-born music director, Jacques Lacombe, and featuring as a soloist the internationally-acclaimed French pianist, Jean-Yves Thibaudet, playing two works by George Gershwin. This is the first of four concerts the NJPAC-based orchestra has scheduled this year in the Morristown venue. The next one coming up is in January, followed by visits in April and June. The house on Saturday was pretty much packed. Some of the music was pretty familiar, though the opening piece, “Remembering Gatsby: Foxtrot for Orchestra” by John Harbison, was new to me. A New Jersey native who currently teaches at the Massachusetts Institute of Technology, Harbison is a jazz pianist and a lot more in terms of his musical inclinations. As a lover of literature, though, he certainly found a jazz inspiration for his tribute to the F. Scott Fitzgerald character. The 7-minute piece calls to mind Astaire and Rogers dancing on air. The original program was rearranged to put the Gershwin-Thibaudet pairing in the second half, and the Harbison piece was followed by the well-known, one might say iconic piece, the “Grand Canyon Suite,” written while the composer, Ferde Grofé, lived in Teaneck. In five parts, the suite paints vivid musical pictures of the Arizona landmark, beginning with sunrise and not quite ending with sunset (a cloudburst follows). Between are a depiction of the Painted Desert and the popular “On the Trail,” featuring the clip-clop of the burro’s hooves. A program note mentions that Grofé originally asked the percussionist in Paul Whiteman’s orchestra to create the sound with coconut shells muted by leather. “On the Trail” is one of the most familiar pieces of American music, having been used in several movies and numerous commercials. We hope the composer collected all the appropriate royalties. The intermission was followed by the placing of the grand piano center stage, and the introduction of Thibaudet. The pianist is well-known as an interpreter of Gershwin, reporting that he first played the composer’s work in France when he was 14. He has played “Rhapsody in Blue” with several orchestras and conductors, and in 2010 released a well-received recording with Marin Alsop and the Baltimore Symphony orchestra. Thibaudet is a lover of jazz and of Gershwin. He has been quoted as saying, “You can’t play Gershwin if you don’t know jazz.” Obviously this Frenchman knows jazz. He opened with a performance of a short piece, Variations on “I Got Rhythm.” Composed ten years after “Rhapsody in Blue” created a sensation, the variations are fun to listen to and provide a great lesson on how a composer can play with a tune. Because the tune is so familiar, the variations are very easy to follow. It did make me wonder, though, what Mozart would have done with that melody. The soloist is quite a showman and his legendary technique is wedded to a great sensitivity to the subtleties of the music. The feelings and images Gershwin evokes are warm, emotional and visual. The opening notes of the wailing clarinet, for example, has to be the sound the rising sun would make if the sun made a sound. This music is full of human emotion. Thibaudet, Lacombe and the orchestra brought this out. The program ended with a performance of Duke Ellington’s “Harlem.” Interestingly, it was composed not for Ellington’s own band but for Arturo Toscanini and the NBC Symphony. Running 18 minutes, it includes 20 distinct musical pictures of the neighborhood the composer was memorializing. A very interesting piece we would like to listen to again. And by the way, the program points out that Ellington also had a New Jersey connection. He lived for many years in Edgewater and recorded at studios in Englewood. There was Molly Goldberg's neighborhood (actually a New York apartment house where everyone visited by leaning outside the windows to converse). There was Mr. Rogers Neighborhood (you may still be able to visit on reruns). And there was ( and still is) the neighborhood of Sesame Street. These eight actors have performed together for so long that their relationships are totally convincing, whether they be family, lovers, friends or, in this case "a bunch of strangers who happen to live" near each other—in other words, neighbors! Using stories of Dreamcatcher’s resident acting company to create a show of vignettes, monologues and songs, Artistic Director Laura Ekstrand has penned a book and lyrics set to music by Joseph Zawila that was so easily recognizable that, as the actors sang and performed their interactions with each other, the audience nodded its collective head in agreement. Lauren Moran Mills (who often directs at the Women's Theater Company) makes her directorial début at Dreamcatcher Rep to great success with a flair that allows one number to segue smoothly into another and showcases each performer very well. We've all met these people in neighborhoods we've lived in. There are the newcomers from the city looking for a better life (and better schools) for their children. You know, the young man (Dave Maulbeck) who can't wait to join the PTA or coach something—anything—even though he doesn't even play a sport! There is the aspiring actor (Jason Szamreta) who commutes by train to auditions, trying to study lines while fielding inane comments by a fellow from his neighborhood. There are the new parents, one (Maulbeck) laid back and enamored by his offspring’s beauty , the other (Ekstrand) hilariously working hard to prepare her infant for college admission. Would-be homeowner Jessica O'Hara-Baker, looking for the "perfect house," lists the odd features of houses she's looked at, like carpet in the bathroom and rooms the size of closets! Harry Patrick Christian extols the joys of being single ("Just One") in the suburbs while Noreen Farley, a "relic" in a neighborhood of young families, searches for a gray-haired gentleman for companionship. And of course, there's the dog whose annoying bark early every Sunday morning wakes up a neighbor (O'Hara-Baker) and drives her to distraction and stern measures. There are many more situations in this two-hour show that will strike a familiar chord. Scott McGowan and Harriett Trangucci drolly portray Lawrence and Sandi, a couple that fights and loves, both very loudly! Their thick New Yawk accents mark them as city émigrés! Farley and Christian are a stitch as a snooty couple who invites their neighbors over for a PowerPoint of their trip to Tuscany! And everyone will recognize the contest that goes on each Christmas to see who will have the largest and most elaborate holiday decorations. The intimate space at the Oakes Center and Zawila's piano accompaniment are perfect for this "little" musical. Though not necessarily known for their singing, the actors do a fine job and certainly "act" the clever lyrics so convincingly that we forget they are “performing.” Musical director Jack Bender is to be commended for guiding the actors through the appealing music. Wesley Krantz's set features silhouettes of houses that suggest a neighborhood without being too fussy. Lighting (Zach Pizza), sound (Jeff Knapp) and costumes (Laura Ekstrand) unobtrusively add to the easily identifiable ambiance. The finale certainly sums up just what "that weird thing-a-ma-bob" called neighbor really is. Facing a catastrophe in the middle of the night, the neighbors gather in the street where the line between "a stranger and a friend" blurs to become a fellowship, a community. To paraphrase the lyrics, “our old neighborhood may not be like the one in our memories, when we look back on our neighborhoods, this is the one we see.” I certainly recognized mine; you will too—and it will delight you! The Neighborhood will be performed at the Oakes Center, 120 Morris Avenue, Summit, through October 14, Fridays and Saturdays at 8 PM and Sundays at 2:00 PM. There will be talkbacks with the artists after the September 30 and October 7 matinee performances. Parking is available in the lot behind the theater on Ashwood Avenue and at the Summit Recreation Center on Morris Avenue. The facility is wheelchair accessible. Assistive Listening devices for the hearing impaired and advance large print scripts are available by prior arrangement. To purchase tickets or for information on any of Dreamcatcher Repertory Theatre's programs, please visit www.dreamcatcherrep.org or call 908.514.9654. Starring Mona Hennessy (Virginia Woolf) and Rachel Black Spaulding (Vita Sackville-West). Photo Credit: Steve Lawler. TICKETS: Call 973.395.5551 or Buy Online! I know this production is in New York, but it sounds very interesting. I served on the selection committee of the Jewish Plays Project last spring and they alerted me to it. 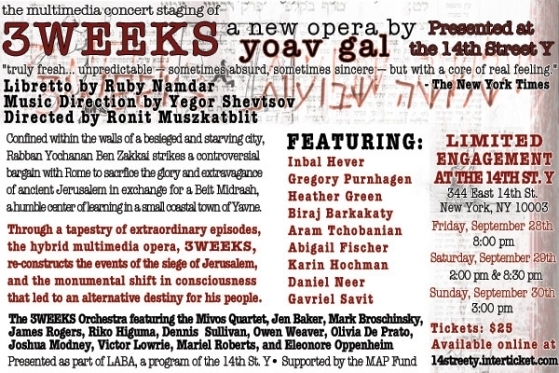 It is not often that an original opera is written. This production is a concert staging using multimedia! Contact: Giggles Director Marie Caliendo at 973.754.4623 or mcaliendo@mmissions.org. Join us for a FREE show “Awesome 80‘s!” by the talented singers of the SRYT! For more information, contact Giggles Director Marie Caliendo at 973.754.4623 or mcaliendo@mmissions.org. 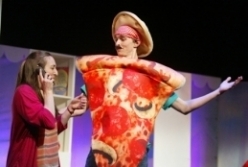 This fun, upbeat musical engages students in the benefits of a healthy diet and exercise by celebrating how positive change can occur through the power of love, hard work and support. I Saw Zero Hour in New York a couple of years ago. Jim Brochu is fabulous as Zero Mostel. And I learned so much about the man who was black-listed during the McCarthy era. A tour de force that is not to be missed! For an up-to-date listing of UC PAC events visit the Calendar of Events page of the website at www.ucpac.org. Please contact the Box Office for further details (732-499-8226). Come taste an exquisite sampling of four delectable dance delights: Douglas Martin's elegantly expressive Ephemeral Possesions, set to Barber's haunting score, was described as ''wonderfully candid'' by The Star Ledger's Robert Johnson. Mr. Martin will also unveil a new scene from Romeo and Juliet, set to the lush score by Prokofiev. Resident Choreographer Mary Barton's playfully sensual Straight Up With a Twist will be performed to live music by Kaila Flexer, thanks to a generous grant from America Music Center. Rounding out the evening will be Trinette Singleton's furiously athletic Capriccios, set to Shostokovich's driving score. Amphion String Quartet is a winner of the 2011 Concert Artists Guild Victor Elmaleh Competition. One of Classical music's rising stars, Fei-Fei Dong was a stunning performer at the most recent Chopin International Piano Competition in Warsaw. Parking is available to patrons at Rahway's multi-level parking deck, located on the corner of Main Street and Lewis Street (across from the Rahway Train Station and behind Hotel Indigo). A free shuttle is often available to and from the theatre. This little theater is a real gem, and the productions they mount are first-rate. If you saw Henry IV, Part 1, at STNJ (and followed up with the reading of Henry IV, Part 2 there as well), here’s a chance to round out your viewing pleasure with Henry V! Look! The NJ Arts Maven is quoted in the critiques! Loved this show! The Bound Brook Fire Department will be hosting a Comedy Night Fundraiser to benefit the Education Fund of Elizabeth "Izzy" Schupper, daughter of Volunteer Firefighter Jim Schupper. Refreshments will be sold along with T-shirts and other items. Please help us spread the word—SHARE this event on your FB page and with your friends list! LEO, the award-winning new show from the acclaimed German company Circle of Eleven, attempts to answer this question as the hero explores a world where gravity has woozily shifted and undertakes a logic-defying adventure that not only reveals his dreams and desires but his lust for life. Through a clever juxtaposition of live performance with projected film, two Leos move through identical spaces governed by opposing physical laws. LEO is a funny, surreal, and surprisingly touching work that challenges the senses and tests perceptions of reality. If you missed this show on Broadway or at George Street Playhouse, not to worry. A new production opens nearby in Chatham. The play, adapted by Patrick Barlow from the novel by John Buchan, features more than 150 characters brought to life by a cast of just four actors in this 2008 Tony Award winning play. It is part juicy spy novel, part Monty Python, and it preserves the brilliance originally created by the master of suspense. David Cantor of Berkeley Heights plays suave hero Richard Hannay who learns from a beautiful spy about a plot of international espionage. The woman is killed in Hannay's flat and he suddenly finds himself caught up in a race from London to Scotland in hopes of stopping military secrets from being smuggled out of the country. As he searches for the secret of "The 39 Steps" he is doggedly pursued by the police who believe he is a murderer. Three of the female roles will be played by Erica Knight of Clinton Twp, while the remaining multitude of characters (spies, policemen, inn keepers, traveling salesmen, etc.) are played by just two actors credited as Clown #1 (Glen Post of Boonton) and Clown #2 (Chip Prestera of Stirling). Photo taken by Howard Fischer. Leading the artistic team is Director Bell Wesel, who is directing her first show at the Chatham Playhouse, having directed previously at Maplewood’s What Exit? Theatre Co. Scenic Designer is Roy Pancirov, Scenic Painting by Andrea Sickler, Costume Designer is Tom Marshall assisted by Bev Wand, Lighting Designer is Richard Hennessy and Sound Designer is Joe DeVico. WHEN: October 5-21; Thursdays at 7:30 PM, Fridays and Saturdays at 8 PM and Sundays at 2 PM. There are 2 PM matinées Wednesdays October 10 and 17 and for the Preview Performance on Friday, October 5 at 2 PM. 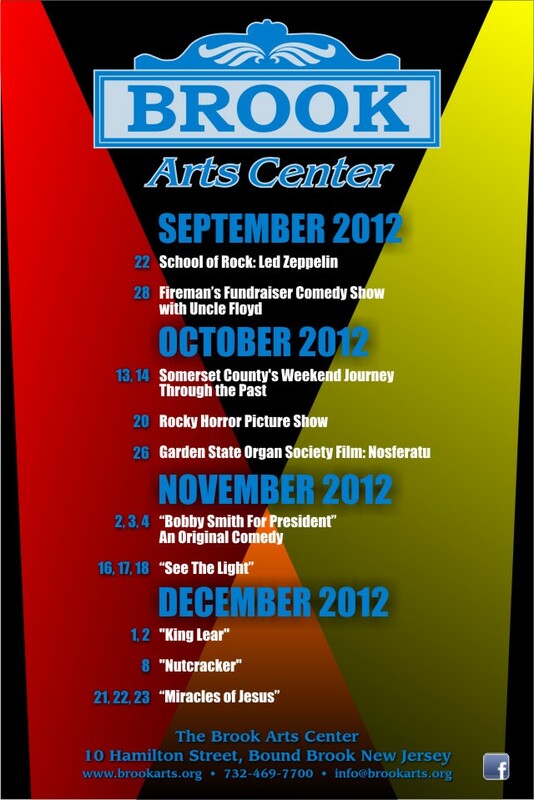 To purchase tickets or to find more information on any of the events listed, visit www.centenarystageco.org or call the box office at 908.979.0900. Broadway veterans and an Emmy winning designer create a world of murder and mystery on the Centenary Stage. This year celebrates the 60th anniversary of the longest running show of the modern era, Agatha Christie’s The Mousetrap. Since its opening in 1952 on the West End of London’s theatre district, this classic has had more than 10 million patrons try to solve the mystery. On the first ever performance, The Daily Telegraph called it ''the cleverest murder mystery ever written for the British theater.'' Today, critics the world over are still raving about this masterpiece written by one of the greatest crime writers of all time. The cast features Kathleen Huber playing the part of Mrs. Boyle. Bringing to life the character of Major Metcalf is Broadway veteran Alan Coates. David Edwards is bringing his numerous talents to the Centenary Stage to play Mr. Paravicini. Kevin Sebastian (Currently Jersey City, Hometown Hazlet) as Detective Sergeant Trotter is returning to the Centenary Stage after appearing as Sir John Melvil in The Clandestine Marriage in 2009. The cast also includes Megan Davis (Hackettstown) and Jon Mulhearn (Pennsylvania) playing Mollie and Giles Ralston, respectively. Thomas Leverton, playing Christopher Wren, has worked with American Theatre of Actors in New York and regionally with Dreamcatcher Repertory Theatre, playing Peter in Peter Pan. And Miss Casewell is being played by Ashley Kowzun (Kenvil). The David and Carol Lackland Center’ Sitnik Theatre is being transformed by Emmy Award-winning set designer Bob Phillips. The Centenary Stage Company is a not-for-profit professional equity theatre, in residence at Centenary College, dedicated to serving as a cultural resource for audiences of the Skylands Region with professional music, theatre and dance events and arts education programs throughout the year. Performances at the Centenary Stage Company are made possible through the visionary support of the Geraldine R. Dodge Foundation, the NJ State Council on the Arts, and CSC members, friends and sponsors, including Premier Sponsor Heath Village, Silver Sponsors Hackettstown Regional Medical Center and The Holiday Inn, and Series sponsors, Fulton Bank, Mamas and Café Bacci, and Restaurant Village in Long Valley. WHERE: Art House Productions 1 McWilliams Pl., Jersey City, NJ. The entire festival runs Sept. 27-30. Tickets are $6 online and at door. For more info, visit my website or hit me up. Just a reminder—my new show "Kookspeak" is premiering Thursday at the So Low Theater Festival in Jersey City! Check out a video from one of my comedic monologues shot by Brett Wilshe in the Landmark Loew's Jersey Theatre. In Senses, a woman’s mischievous mind refuses to let her deny her love for her soulmate. Here, she imagines performing at the Grammys with him, a FIFA World Cup star/YouTube phenomenon played by local musician John Feuerbach, by her side. This was a super fun shoot and I'm super psyched to do it live! Hope you can come out to see me! That drama has the ability to make us feel uncomfortable is one of its great powers. Several recent plays have shined a light on the effect of a tragedy on parents of a young child; Rabbit Hole by David Lindsay Abaire comes to mind wherein a husband and wife deal very differently with the death of their young son. Add to that list the dark comedy Smudge by Rachel Axler opening the 2012-2013 season at Alliance Repertory's new outpost in Berkeley Heights. Stunningly and lovingly directed by Michael A. Driscoll, this 80-minute play targets the response of two young first-time parents when their child is born severely malformed. The music Driscoll has chosen to open the show, a vocal arrangement of Shakespeare's "Oh, what a piece of work is man" speech from Act II of Hamlet, sets the scene for what follows. Trouble looms on the horizon when an ultrasound reveals an indeterminate shape, a "smudge" as Colby Stillman, the mother, calls it (left). She's been suffering from terrible nightmares which she thinks presages disaster. Unfortunately, she's right, for the child, who Nick, the dad, names Cassandra, has no limbs and one eye. Of course, we never actually see the baby, but Colby's reaction is enough to tell us that catastrophe has struck. The three actors Driscoll has cast are long-time Alliance Rep Company members, and they perform with their usual professional aplomb. As Colby, Lilli Marques has a difficult, rather unsympathetic, role, for she rejects the baby, taunts it and even calls it "entrails encased in a hot dog." Nevertheless, she ably communicates the young woman's pain at having produced a less-than-perfect child. Gus Ibranyi's Nicholas at first appears to fare much better. He bonds with the child, tries to get it to exercise its eye by moving a stuffed carrot toy in front of it and actually looking at the baby (left). When he finally calls Cassandra "the little monster," we sense his hopelessness. It falls to Brad Howell as Peter to deliver most of the very funny, profane and often outrageous lines. Just watching him read messages from their mother that he's scribbled on sticky notes (and sticking them to different parts of his body) is a real howl (right). Yet when he shows up uninvited to visit his new niece, his reaction at seeing her tells us all we need to know. Best of all, the fraternal chemistry between Howell and Ibranyi is totally believable. As Alliance Rep Artistic Director, Michael Driscoll often picks unusual plays not often seen, many of which have a dark side. However, they do offer a glimmer of light through all the darkness. So too does Smudge. Without giving away the ending, suffice it to say that a detente between the two parents is reached in a very sweet ending. Alliance Rep has recently moved from its home at the Loft above the Union County Performing Arts Center in Rahway to the Wharton Music Center in Berkeley Heights. The new performing space is quite attractive (and resembles that of the Loft), but its location is a bit off the beaten path, and there is no lit sign outside the building advertising Smudge. If you are a fan of theater that does not present the same old, same old, it is worth a trip to 60 Locust Avenue (off Snyder Avenue, which is off Springfield Avenue) in Berkeley Heights. I promise you that it is worth the trip. Smudge will be performed at Alliance Repertory at the Wharton Music Center, 106 Locust Avenue (in an industrial park of office buildings, not residential) in Berkeley Heights through September 29, Friday and Saturday at 8 PM. For information or tickets call 908.472.1502 or visit the website: www.AllianceRep.org. On a minimal stage comprised of several platforms (all painted black), a video screen on which scenes and titles (and a video of Sondheim himself at the piano) are projected, and a white sail-like sheet stretched rather incongruously across the back, six talented singers perform tunes from a variety of Sondheim musicals for which he wrote both the music and lyrics by himself. For 90 minutes we are treated to 22 Sondheim songs sung by six very talented performers. Hafen keeps them moving effortlessly around the stage, segueing from one number to another with nary a moment to breathe. Best of all, the singers actually act the lyrics, so that we get a poignant "Being Alive" (Company) sung by Adrianne Hick (it's actually sung by the male lead in that show) and a heart-wrenching rendition of "Not a Day Goes By" (Merrily We Roll Along) warbled by Tamara Hayes. That the latter is sung before a divorce proceeding, as the narrator tells us, makes her pain even sharper. There is great fun in this production, too, provided most often by the men singing selections from A Funny Thing Happened on the Way to the Forum, a musical version of Aristophanes' The Frogs (first performed in a Yale University swimming pool) and a little-known play called Saturday Night. This mood is set in the opening moments when the cast calls upon the gods of the theater to smile on them and then launches on a list of don'ts for theater patrons (Above). Among them are don't cough, don't leave, don't say, "what?" For me the most interesting moments came in the performance of two songs from Pacific Overtures, the only Sondheim show other than Saturday Night that I have not seen. Its premise is the opening of Japan to the West—in this case the Americans—in 1853; doesn't sound like an topic for musical theater, but once again, Sondheim's lyrics tell the compelling story of the clash of two very different cultures. In "Poems," an American ship captain (Patrick Moran) and a Japanese samurai (Michael Padgett) pass the time taking turns composing poems about rain, haze, wind, dawn. The samurai's are artful and detached while the American's express his homesickness for Boston and his family there. It is very touching and a bit droll. The other song has to do with the treaty itself, recounted by an old man (Danny Arnold) who as a ten-year-old boy (Tamara Wood) observed the goings on from his perch in an overhanging tree and a samurai (Patrick Moran) who, hidden under the floor of the tea house, overheard the conversations. Their memories put together give a credible account, but what was said there is less important than the recollections of the two men. Musical accompaniment by Jim Donica on the bass and Jonathan Gleich on percussion at first was quite loud and made it hard to hear the singers, but it quieted down as the performance progressed. They are joined from time to time by Adrianne Hick on cello and Lindsay Wood on violin to fill out the sound. Andrea Dante has dressed the women in jewel-toned jersey dresses that stand out against the black background. Lighting by Thomas Rowe was a tad spotty; several times singers were in shadows until they moved to a lit section of the stage. You're Gonna Love Tomorrow is an interesting glimpse at the ability of Stephen Sondheim to tell a story through his lyrics, words that, in this case, are acted by the talented singers performing them. Without the glitz and glamour, it is easy to focus on the words. My only complaint: at an hour and a half (no intermission), the show felt a bit too short. I was left wanting more. You're Gonna Love Tomorrow will be performed through October at the Bickford Theatre, 6 Normandy Heights Road, Morristown. Performances are Fridays and Saturdays at 8 PM and Sundays at 2 PM. For information and tickets, call the box office at 973.971.3706. MIDTOWN DIRECT REP CONCERT ALMOST SOLD OUT! BARN THEATRE SEEKS 4 ACTORS TO PLAY 20 ROLES! PRINCETON CHILDREN’S BOOK FESTIVAL THIS SATURDAY!